At 23 years old, I still have a lot of life to live. Fortunately, throughout these years I have been blessed with great advice from my parents and family, helping me get through stressful times while 2,000 miles away at school and guiding me to be a better person. I have collected these thoughts and notes over the years and have compiled my favorites here to share with you. 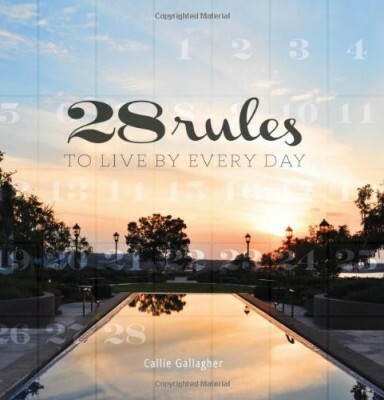 I’m hoping the title ’28 Rules’ does not scare anyone away. Frankly, I don’t like rules, and it sounds a bit rigid. As a child growing up, I did everything I could to avoid my parents’ rules. However, like on the road, I’ve come to realize rules are necessary to keep things flowing smoothly. I find that these help me keep my life flowing smoothly and allow me to maintain a perspective of what’s really important. If you don’t like ‘rules,’ I hope you might think of these as gentle guidelines from a loving parent, or friend, to help you navigate the daily grind.